Overview: This hike covers the bloody fighting around Fort Steadman and the Crater during the siege of Petersburg. The route follows both the Confederate and Union lines and meanders through open fields and woodland. Informative markers along the trails help to describe the fighting that took place during the nine-month siege. Be aware that a portion of this hike is closed from December 15 to July 15 due to bald eagle nesting. The physical beauty around Fort Steadman should be motivation enough to park the car and take a long stroll through this amazing battlefield. After the Union disaster at Cold Harbor, Union Lt. Gen. Ulysses S. Grant decided to move the Army of the Potomac across the James River and assault the important rail center of Petersburg. Petersburg was vital to the Confederates because it was a junction of five railroads that supplied Richmond and the Army of Northern Virginia with supplies and food. Grant knew that if he could capture the city, Confederate General Robert E. Lee would not be able to defend Richmond or receive necessary supplies for his army. Fort Steadman and the Crater Hike: I like to start this hike at the Fort Steadman parking lot. Walk up to Fort Steadman and enter the fort. The walls of the redoubt held six cannons at the time of the battle. The fort was an anchored to the north and south by a chain of batteries and rifle pits along with Fort Haskell and Fort McGilvery. The fort was constructed on the same ground where the 1st Maine Heavy Artillery made a daring charge against the Confederate line on June 18th, 1864. Fort Steadman was an obvious choice to be attacked by the Confederates, because it was located only 300 yards from the Confederate line. As the Union army began extending it’s lines to the west, General Lee knew it was only matter of time before his men would be stretched too thin and his defensive line would eventually break. Lee discussed his plans with Confederate Maj. Gen. John B. Gordon and told him, "There seemed to be but one thing that we could do—fight. To stand still was death. It could only be death if we fought and failed.” Soon after, Gordon began devising a plan to attack Fort Steadman, which would be Lee’s last offensive of the war. Gordon believed that if he could break through at Fort Steadman, he could cut the Union railroad that brought supplies from City Point and attack both north and south along the Union line. Retrace your steps and follow the Colquitt’s Salient Trail towards the two cannons that are pointed towards the Confederate line. This battery was part of the Union defenses. Follow the trail down towards the right. Here you will find the 1st Maine Heavy Artillery Monument. The 1st Maine Heavy Artillery regiment was pluck from Washington’s defenses for Grant’s final push towards Richmond. The charge made by the 1st Maine Heavy Artillery on June 18th turned into a slaughter costing the regiment 604 causalities in just ten minutes. This was the largest lost of men by a single regiment during the entire war. Continue on the trail until you reach Colquitt’s Salient. During the pre-dawn hours of March 25th, Confederate Maj. Gen. John B. Gordon’s assault began from Colquitt’s Salient with almost half of Robert E. Lee’s entire infantry. The initial attack surprised Fort Steadman due to the depression on the right that allowed the Confederates to remain hidden and storm Fort Steadman. Unfortunately for the Confederates, the attack began to stall as Union Brig. Gen. John Hartranft sent in reinforcement and the Confederates became confused and failed to capture the Union batteries to the north and south. Turn left onto Poor Creek trail that leads past Gracie Salient before heading onto the hardwoods forest. As you walk along Poor Creek, it easy to understand why Union troops did not attempt to climb the steep banks of the creek to assault the Confederate lines that lie on the other side of the creek. It is this section of trail that is closed from December 15 to July 15 due to the bald eagle nest in the area. Continue on the hiking trail until you emerge from the tree line onto the Taylor Farm site. Here you can see the ruins of slave quarters on the Taylor Farm that was used by both sides during the siege. Ironically, it was also in this area where the 19th U.S. Colored Troops waited before they assaulted the Confederate lines during the Battle of the Crater. As you walk, look right past the important Norfolk & Petersburg railroad where the Battle of the Crater occurred. Continue on the hiking trail until you reach the tour road and turn right. Follow the road over the Norfolk & Petersburg railroad until you come to the Battle of the Crater parking lot. Follow the trail that leads from the parking lot, towards the right, until you come to the entrance of the mine. During the summer of 1964, former Pennsylvania coal miners from the 48th Pennsylvania regiment began digging this mine so they could detonate gunpowder under Elliott’s Salient, a Confederate strong hold. Follow the 511 ft. mineshaft towards the where four tons of gunpowder was packed under the Confederate’s salient. You can still make out where the former Pennsylvania miners dug a vertical ventilation shaft to provide air as they worked. The plan was for a gap to be blown in the Confederate defenses and have the United States Colored Troops led by Union Brig. Gen. Edward Ferrero to flank the crater and take control Jerusalem Plank Road. At the last moment, despite two weeks of training for the United States Colored Troops, Union Maj. Gen. George G. Meade ordered Brig. Gen. James H. Ledlie’s 1st Division to lead the attack. During the early hours of June 30th, 1964, the gunpowder was detonated; creating a 30 ft. deep crater that instantly killed 278 Confederate soldiers. After the explosion, the Union attacked stalled due to awestruck soldiers. This delay allowed Confederate Brig. Gen. William Mahone to prepare his men for a Union attack. Unfortunately for Ledlie’s 1st Division, they did not move around the crater like the United States Colored Troops were trained to do. Instead, Ledlie’s men wandered into the steep sided crater that allowing the Confederates to shoot down into the trapped Union soldiers, which Mahone called “a turkey shoot.” The disorganized Union attack lead to 4,000 killed, wounded, and captured Union soldiers and only 1,500 for the Confederates. Continue on the trail until you reach the crater. Years of erosion has begun to filled in the crater, but the shallow depression still allows visitors to get an ideal for the amount of earth that was thrown into the air as the gunpowder exploded below. Follow the trail to the right. Here you can see where Confederates dug listening mines, trying to determine what the Union soldiers were conspiring. Follow the hiking trail past the Confederate cannon, to the backside of the crater. The largest monument you encounter is dedicated to Confederate Brig. Gen. William Mahone, whose troops rushed towards the crater and repulsed the Union attack. 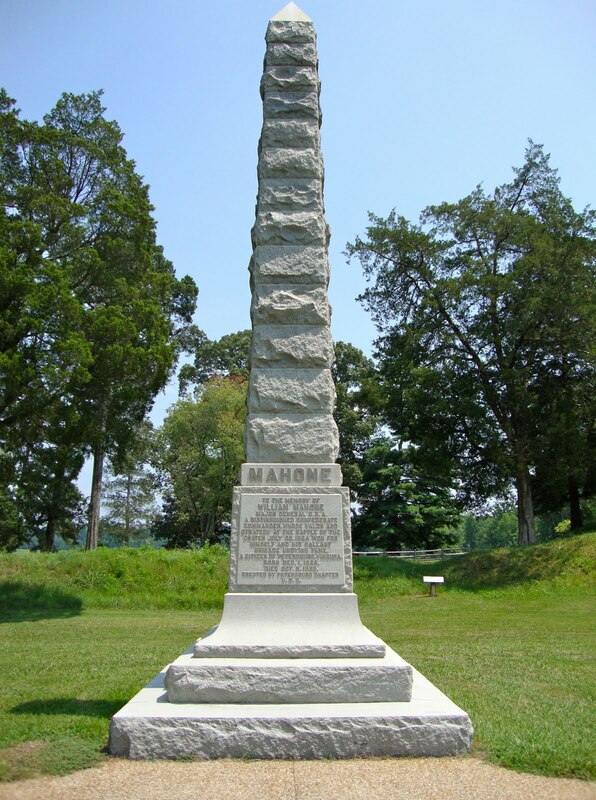 Next to Mahone’s monument is advance position monument reached by the 2nd Pennsylvania Heavy Artillery Regiment. Take time to read the other monuments that line the path and try to image the carnage that occurred on the now peaceful stretch of land. After you finish soaking up the Battle of the Crater, make your way back to the parking lot. Turn left onto the tour road and follow it back towards Fort Steadman. As you walk past the Norfolk & Petersburg Railroad, you route will follow the Union line where you can still make out the trenches and forts that laid siege on Petersburg. The first fort you encounter is Fort Morton near the Taylor Farm, where 14 cannons help during the attack of the crater. Continue on the tour road until you reach Fort Haskell. During the attack on Fort Steadman, Union soldiers took refuge in Fort Haskell only to be fired on by Union artillery to the south that thought the fort had been captured. Cannons captured by Confederates at Fort Steadman also pounded Fort Haskell from the north. During the early hours of the next day, Confederates attack Fort Haskell, using the ravine to your right for cover but artillery from Fort Haskell helped to turn them back. Follow the tour road back to the Fort Steadman parking lot and to your car. This concludes the Fort Steadman and Crater hike. Excellant description of battles and love the photography.Anxious to try this hike. Thank You. Thank you. Let me know if you need any other hiking suggestions while in the Petersburg area. Great website. Thanks for sharing. When my brother and I visit a civil war battlefield, we always park the car and see the battlefield the way the soldiers did...on foot. Civil War Hikes is a resource of hiking trails, walking guides, and the fighting that occurred on the hollowed ground that we walk.